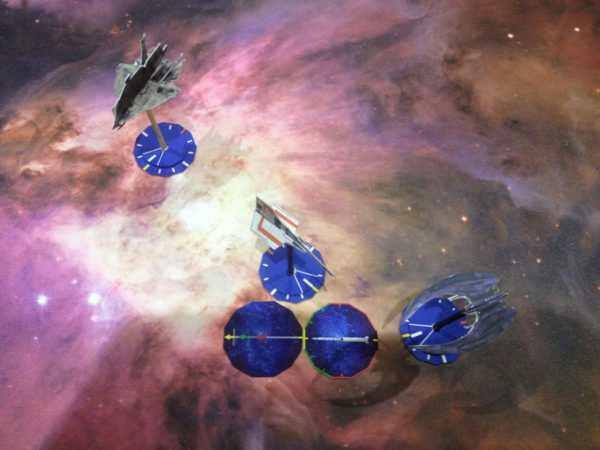 The news has been making the rounds across the websites but I thought I’d weigh in briefly on Ares Games’ announcement that they are developing a starship battle game set in the Battlestar Galactica universe. The game “scale” looks to be a dogfight scale game with players controlling a number of individual fighter scale ships. So even though it was just announced, there is quite a bit of detail to digest. The first public outing of the game will be at Gen Con in August. Ares Games doesn’t show that well at Gen Con so I hope they beef up their presence in Indianapolis as I’m usually disappointed with their booth’s lack of actual product. I know that this convention is not the easiest for publishers due the expense but hopefully Ares will at least bring enough product to show off a few demos. I’m a huge fan of X-wing so this game will have to really make good on a lot of the cool innovations mentioned above to get me to bite. Aside from X-wing, another potential barrier is I’m not a fan of the show. It’s not that I don’t know it, I actually am one of the few that just didn’t enjoy the first few episodes and didn’t find it worth pushing further into the series. That won’t make me look at the actual game with any negativity, just that the game won’t benefit from getting a free-pass for weak details like other games might when my fanboy-ism might override my good sense. The development history of this game is pretty interesting as well as the team had pitched a potential Battlestar version of their Wings of War (now Wings of Glory) line to Fantasy Flight Games back in 2007 but for several reasons, it never came to light. I look forward to hearing more about the game in the coming months and hopefully demoing it at Gen Con. Walking Dead Wednesday: Hammer Time!